One of my short stories is featured in this collection, 'Flames'. My review does not include that story.This is a diverse collection of stories, there's something for everyone in this anthology.Wish Upon A Star by Lainey BancroftAn insightful tale about a gifted singer who falls prey to the ravages of fame. Lainey is an author who understands the human psyche well.Tears For Hesh by J. Michael RadcliffeAn entertaining fantasy tale, containing wizards, magic, curses, and spells. Hesh is a likeable character and I felt compassion for him. Well written with a tragic twist.You Can Call Me Ari by Darcia HelleA chilling, suspense story to keep you on the edge of your seat. By far the most vivid story in the collection. The descriptive quality of the writing pulls the reader in. Fans of Darcia's writing can be assured that even though this is just a short story it is just as scary as her novels!Minor Details by Jaleta CleggA humourous tale about two teenage girls, one of whom can't spell. This leads to an unfortunate turn of events (or, fortunate, depending on how you look at it!) A fun read.Ice Cream Man by Neil SchillerHaving read and enjoyed Neil's collection of short stories Oblivious, I was not disappointed by this story. It contains the same moody feel as much of his writing. It is in essence a poignant story of disappointment.No Eyes But Mine Shall See by Sharon E. CathcartSharon Cathcart sets the scene well in this heartbreaking story of a love denied. I liked the descriptive quality of the writing. Much of the story is written in the form of a letter that will never be read, making it all the more heartrending.The First Texas Twister by Magnolia BelleA fun and entertaining tale about how the Wild West collided with Native American culture to create the first tornado.Shadow Lantern by Gareth LewisAn interesting concept. A short story told entirely through dialogue with no narrative. At first, I didn't think it would work, and must admit to being a bit confused as to which character was speaking at times. By the end, however, I found myself entertained by this fantasy tale.Stained by Amy SaundersI hadn't read any of Amy's work before this short story, but now I will be seeking out more of her writing. I was very impressed by the way the author deals with the main character's emotions after a traumatic event. The tale is enthralling and the ending is moving. All believable characters.All in all, this is a great collection and a wonderful way to introduce readers to some very talented independent authors. A refreshing and concise anthology--I enjoy "variety" in both life and literature, and I enjoy anthologies such as this one because of the diversity offered.This introduces the reader to different genres and narratives styles, something which I greatly appreciate. Commercial mainstream fiction tends to be more homogenous than original/innovative, which is why anthologies such as this are great to introduce new readers to a range of independent writers/authors. In the independent scene, a writer can maintain creative control over their work (without altering it so that it suits a certain "commercial category" better). In this anthology, you'll get suspense; an introspective/engaging story involving a lost love and a lost earring; a story told entirely in dialogue; an insightful story reminiscent of the film "Country Strong"; a fantasy story about wizards and spells; and more. All for the price of FREE too--so set aside some time, download a copy, and see what gems you discover for yourself ;)P.S. Be sure to also check out . 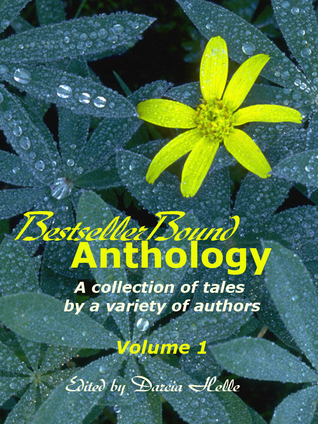 As I have a story in this anthology, my review applies to the other nine tales.The "Bestseller Bound Anthology" has something for everyone. Genres range among science fiction, modern romance, historical fiction, crime and Westerns ... with a few stops in between. There are no "duds" in this collection. My favorite story of the lot was "The First Texas Twister," which incorporates elements of Western and supernatural fiction.Well-done across the board and definitely worth your time to read. Ten shorts from different genres and all for free? Well done. This book is like a tasting platter at a lovely restaurant; not everything was quite to my tastes, but I'm glad that I gave it a try. As a contributing author, my review applies to the other nine tales in this anthology. I am very humbled to appear among such a talented group of writers. Although the anthology covers a wide range of genres/settings, the writing is strong and characters well developed. I thoroughly enjoyed all of the tales and highly recommend seeking out these authors in the genres you enjoy! An enjoyable collection of varied tales by an imaginative/talented group of writers. There's something here to meet most every reading taste. One of my short stories is featured in this collection, 'Flames'. My review does not include that story. This is a diverse collection of stories, there's something for everyone in this anthology. 'Wish Upon A Star' by Lainey Bancroft An insightful tale about a gifted singer who falls prey to the ravages of fame. Lainey is an author who understands the human psyche well. 'Tears For Hesh' by J. Michael Radcliffe An entertaining fantasy tale, containing wizards, magic, curses, and spells. Hesh is a likeable character and I felt compassion for him. Well written with a tragic twist. 'You Can Call Me Ari' by Darcia Helle A chilling, suspense story to keep you on the edge of your seat. By far the most vivid story in the collection. The descriptive quality of the writing pulls the reader in. Fans of Darcia's writing can be assured that even though this is just a short story it is just as scary as her novels! 'Minor Details' by Jaleta Clegg A humourous tale about two teenage girls, one of whom can't spell. This leads to an unfortunate turn of events (or, fortunate, depending on how you look at it!) A fun read. 'Ice Cream Man' by Neil Schiller Having read and enjoyed Neil's collection of short stories 'Oblivious', I was not disappointed by this story. It contains the same moody feel as much of his writing. It is in essence a poignant story of disappointment. 'No Eyes But Mine Shall See' by Sharon E. Cathcart Sharon Cathcart sets the scene well in this heartbreaking story of a love denied. I liked the descriptive quality of the writing. Much of the story is written in the form of a letter that will never be read, making it all the more heartrending. 'The First Texas Twister' by Magnolia Belle A fun and entertaining tale about how the Wild West collided with Native American culture to create the first tornado. 'Shadow Lantern' by Gareth Lewis An interesting concept. A short story told entirely through dialogue with no narrative. At first, I didn't think it would work, and must admit to being a bit confused as to which character was speaking at times. By the end, however, I found myself entertained by this fantasy tale. 'Stained' by Amy Saunders I hadn't read any of Amy's work before this short story, but now I will be seeking out more of her writing. I was very impressed by the way the author deals with the main character's emotions after a traumatic event. The tale is enthralling and the ending is moving. All believable characters.All in all, this is a great collection and a wonderful way to introduce readers to some very talented independent authors. This is a short story anthology by a group of very talented authors. All of the stories were enjoyable and well written. I enjoyed the entire collection. I found some stories more enjoyable than others, but I'm not sure if that was because of the story or because they fell more into genres I generally read. Several of the stories had quite interesting twists. I was impressed by the variety in this collection. It ranged from romance to suspense to fantasy...even a folk tale! That kept it fresh from cover to cover. It was a quick, fun read with several excellent stories. Writing a good short story is a difficult writing task that was accomplished quite admirably by several of these authors. I look forward to reading more from this group of talented authors. Free for Kindle.Collection of 10 short stories - varying style and ability.Wish Upon a Star by Lainey Bancroft was about a young singer who abuses her gift and suffers the consequences. 3 stars.Tears for Hesh by J. Michael Radcliffe was very sad and touching. I really felt emotion for the main character in a very short time. Hesh, a 7-foot awkward servant for an evil wizard suffers a horrible fate when he learns his master's plans for murder. 4 stars.Minor Details by Jaleta Clegg was very funny. Fashion, reindeer poop, pentagrams, hearts and flowers, and what happens when would-be witches can't spell. 4 stars.Other seven were so-so stories. The only story I really enjoyed was “Tears for Hesh” by J. Michael Radcliffe. All of the other stories were readable and I did finish the anthology, but they just weren’t memorable enough for me. A refreshing and concise anthology--I enjoy "variety" in both life and literature, and I enjoy anthologies such as this one because of the diversity offered.This introduces the reader to different genres and narratives styles, something which I greatly appreciate. Commercial mainstream fiction tends to be more homogenous than original/innovative, which is why anthologies such as this are great to introduce new readers to a range of independent writers/authors. In the independent scene, a writer can maintain creative control over their work (without altering it so that it suits a certain "commercial category" better).In this anthology, you'll get suspense; an introspective/engaging story involving a lost love and a lost earring; a story told entirely in dialogue; an insightful story reminiscent of the film "Country Strong"; a fantasy story about wizards and spells; and more. All for the price of FREE too--so set aside some time, download a copy, and see what gems you discover for yourself ;) P.S. Be sure to also check out . It was free, so I can't complain too much, but...Torturing a heroine beyond all belief does not endear her to readers; it makes the story painful to read. Enemies should not have long conversations with potential threats to their existence. It seems a very silly way to stage an info-dump.Claiming that your fiction is a powerful, literary experience in your author's notes is highly pretentious and off-putting.Some stories were too insipid and boring to finish.All in all, the title for the anthology is misleading. This collection was alright, nothing to brag about. It is short, free (Kindle users), and somewhat entertaining. The writing is good and most of the stories are grounded in reality, giving them a believable tone. I also found two of the stories in this collection to be totally pointless (not mentioning the names though). My favorite one was Tears for Hesh, a fantasy tale of magic and ultimate betrayel). What an impressive anthology of stories. This collection contains short stories from a variety of genres and you're sure to discover talented new authors for your to-read list. I read it in a weekend and was always disappointed to finish a story, thinking the next one couldn't possibly reel me in as much as the previous one, but I was wrong. The Bestseller Bound collection had me hooked from page one until the end. I have been meaning to read this for ages and am glad I finally had the time.A great well-written collection of shorts, which range from murder to magic, gruesome to psychological - cleverly done with much meaning packed into so few words.Recommended. A few good, a few so-so.